It was a second period to forget for the No. 15/15 Quinnipiac Bobcats as three power play goals in a span of less than a minute by the No. 4/3 Harvard Crimson blew a tie game open for the home team. The Bobcats first ECAC league game in almost a month ended with the same result as their last ECAC game at the end of the first semester, a loss. Quinnipiac and Harvard played a fast paced game in the early stages of the first period before Harvard's John Marino took an interference call at the 10:15 mark of the opening frame. Sixteen seconds later Thomas Aldworth split two Harvard defenders and backhanded a shot past Merrick Madsen for the early 1-0 Bobcat lead. 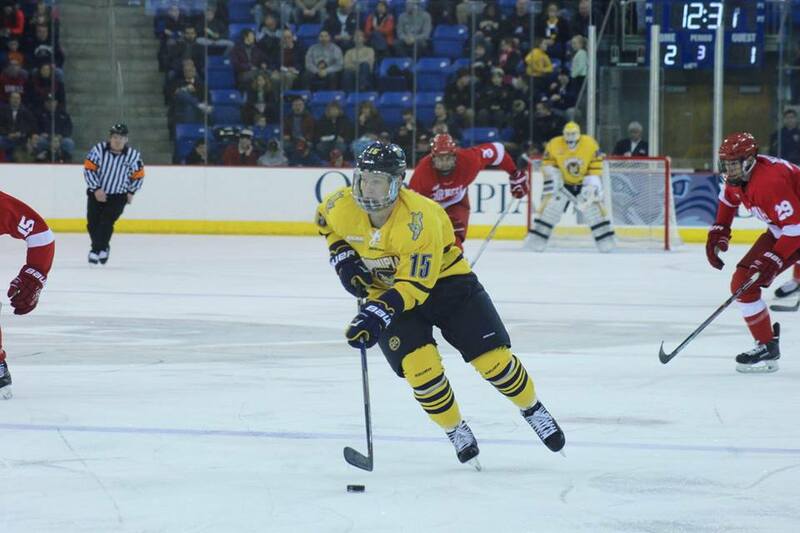 Luke Shiplo and Chase Priskie recorded the assists for Quinnipiac. Six and a half minutes later Harvard's Sean Malone put one past Chris Truehl to even the score. 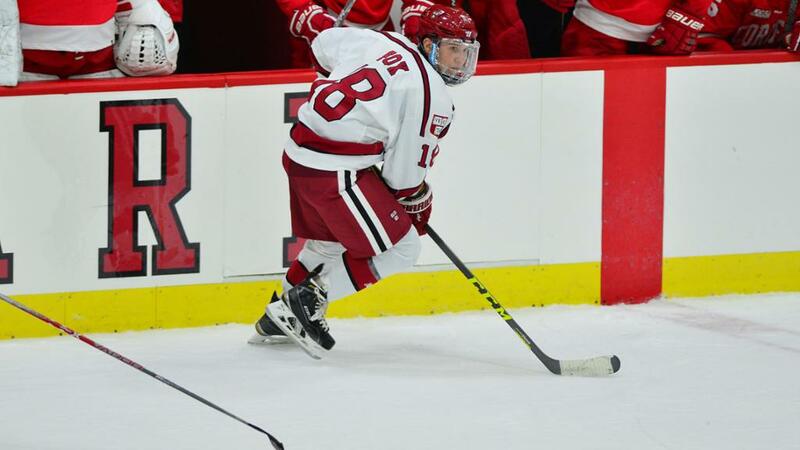 Tyler Moy and Adam Fox had the assists on Harvard's first goal. Fox recently returned from the World Junior Championships where he won a goal medal representing Team USA. He had played three prior games this week for the United States before seeing action in tonight's contest. Harvard out shot the Bobcats 14-10 in the opening frame. Early in the second there was solid back and forth action but the game remained tied. The Bobcats Connor Clifton took a slashing call at the 3:51 mark that was the beginning of the downfall on the night for Quinnipiac. Tanner MacMaster joined him in the penalty box a little over a minute later giving the Crimson a five on three power play. Thirty five seconds just as the Clifton penalty was set to expire it was Harvard's Nathan Krusko (assisted by Sean Malone and John Marino) scoring as the puck slid off his skate past Truehl and into the net. Quinnipiac coach Rand Pecknold wanted the play reviewed and continued to show his displeasure in referee Chip McDonald who then called a bench minor on Quinnipiac and ejected Pecknold from the game. They ended up still reviewing the play and confirming the call on the ice of a goal. With Harvard back on a two man advantage the flood gates began to open up. Twenty six seconds later it was Alexander Kerfoot on the power play from Tyler Moy and Adam Fox to make it 3-1 Harvard. Eighteen seconds later it was once again Krusko on the power play from Luke Esposito and Sean Malone for a 4-1 Harvard lead. Just like that the game was broken open and Chris Truehl was pulled in favor of Andrew Shortridge. Surprisingly, Quinnipiac out shot the Crimson 13-11 in the middle frame. With the game just about out of reach the Bobcats and Crimson played well in the early stages of the final period. They traded early penalties less than five minutes in into the game. Quinnipiac picked up three more power play opportunities the rest of the game and finally capitalized when Luke Shiplo ripped a shot high past Madsen. Tanner MacMaster and Kevin Duane got the assists. Harvard got a late empty net goal by Krusko (Tyler Moy assist) who recorded first collegiate hat trick to seal the victory. Quinnipiac out shot the Crimson 13-9 in the final period and 36-34 for the game. Andrew Shortridge was very solid in relief of Truehl with 12 saves in the game. The story of the game was that of the Bobcats coming unglued in the second period and of Pecknold being ejected from the game. This is the fifth loss in the last six games for the Bobcats something they have not been accustomed to in a very long time. You have to give a ton of credit to this Harvard team. This might be the most talented team that Ted Donato has had in his tenure in Cambridge. They have the look of a team destined for the Frozen Four in Chicago as they have scoring, top defenders, a very good goaltender and an outstanding power play. With the loss Quinnipiac falls to 11-9-2 (6-5-1 ECAC) on the season and drops to 21st in the pairwise rankings. Harvard improves to 10-2-1 (6-1-1 ECAC) and into a tie with Quinnipiac for third place in the conference with four games in hand on the Bobcats.